« Day 136 in Beijing: Halloween. In Ito Yokado. Beijing Style. Most of us know about Amazon.com. It is essentialy the same company here in China except the URL is Amazon.cn. The “cn.” stands for China. If you live in Western nations you have probably ordered something from them and it has been delivered by a truck with a bunch of other packages. 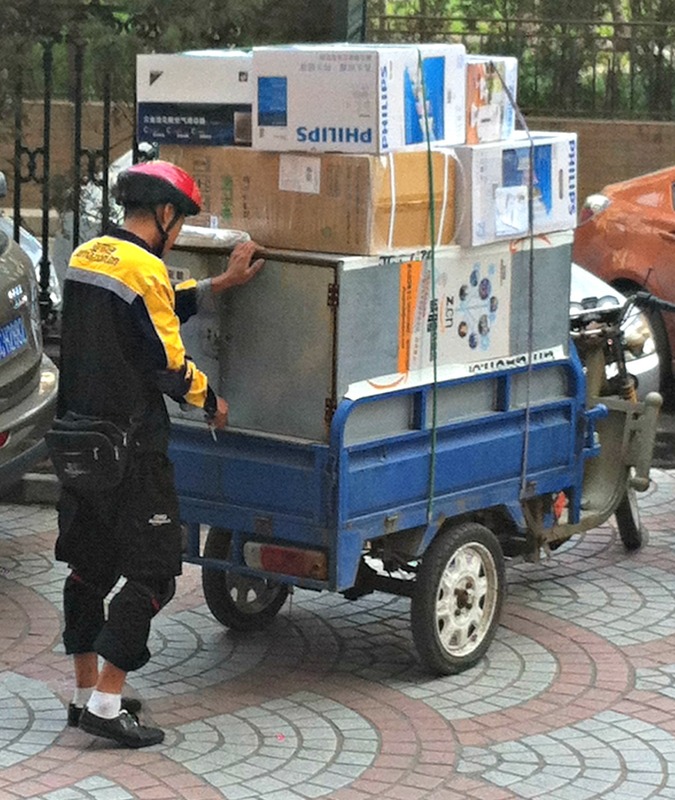 I’m used to seeing deliveries by the big UPS or Amazon trucks and hadn’t really thought about how Amazon in China has their products delivered. I only knew that they are fast as can be. I often receive my packages the day after I order and they always call me on my cell to let me know they are coming before they arrive. Of course, I then have to call my friend who speaks perfect Mandarin, to tell them that I’m home and they can deliver it. Yes, I’ve been slacking on learning Mandarin. One day at a time. Anyway, as I walked out of my apartment I saw the customary yellow and black branding on Amazon on this gentleman. I looked at his jacket and it definitely was Amazon. 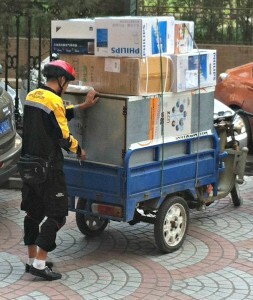 I love how strategically he has stacked all his deliveries and how perfectly aligned everything his packages are on his three-wheel motorcycle. By the way, many of the bikes here are electric. They have a range of about 20 miles and go up to 20 miles per hour. They cost about 200 dollars and are fantastic. I have no idea why they are so expensive in the USA other than mark up and wish they were cheaper. I would have bought one long ago as they are incredibly efficient, easy to park, and can be recharged every night by taking the battery inside an apartment and just plugging it into a normal outlet.